There are a lot of riders that appreciate true quality and the finest materials. Historically, Klim has met this requirement with their use of Gore-Tex, high quality codura, and more recently their D30 armor. The only downside is that the price climbs with quality, making the $600-$900 jackets less attainable. What if all of your basics were covered with the same quality goods, but set you back less than $400 a piece? The Klim Overland Jacket & Pants fill this gap in price point without creating a void in durability or capability of their garments. The Klim Overland Jacket is an weatherproof, protective shell meant to be worn over your mid and base layers while riding street. Its 840D Codura panels protect you in the impact zones, while the integrated 3M Scotchlite keeps you seen. Using the latest in D30 technology, the Overland comes with T5 Evo XT protectors in the elbow and shoulder. This separates the overland from the Traverse, specifically positioning it for street use. Gore-Tex Performance Shell completes the package, offering a waterproof guarantee for the life of the garment. If that isn't enough, the Overland also features four vents, three external pockets, and one zippered interior pocket. Built from the same blocks, the Klim Overland Pants also feature the D30, Gore-Tex, and Codura technologies. Ventilation comes in the form of two thigh intake vents and two rear leg exhaust vents. 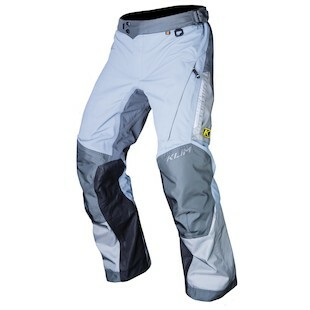 Baby brother to the Lattitude, the Klim Overland set promises to be a quick seller. 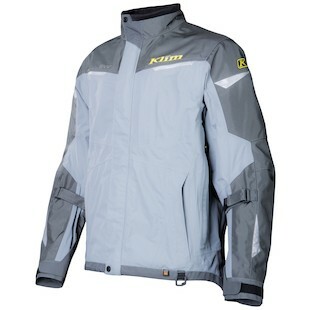 We would expect no less in performance from a reputable brand such as Klim.